My eyes dart from the road ahead of me and back down to the speedometer; eyes up, eyes down, watching the numbers climb as my legs drive through the pedals. I feel all muscles from my feet to my hips fire and I know I am exerting every amount of power within me to make this bike go as fast as possible. The wind races past my ears and blocks out any external noise. It’s just the road, my bike, the wind and me. I see the surface of the road in front of me is cracked and scattered with potholes, but I don’t slow down, until… thud. The smooth roll of my tires turns clunky and I can hear a distinct hissing noise coming from beneath me. Three different brash curse words fly from my mouth as I realize I have a flat tire. 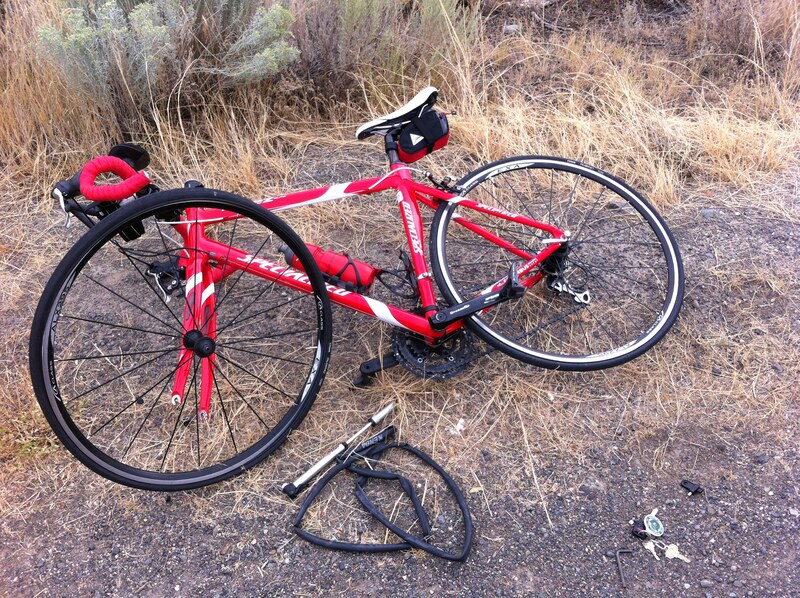 There is nothing worse than having the perfect ride interrupted by the unfortunate escapade of fixing a flat tire. The only other time I attempted to change a tire, I ended up in the bike shop looking frazzled and distressed, pleading for their assistance. But almost 10 kilometres from home, and with my cell phone battery at 2%, I was left to my own devices, which meant figure it out or walk home. It’s amazing what you can do when threatened with the prospect of walking for the next two hours. Within about 10 minutes I had popped out the old tube, popped in a new one and was back in the saddle. But only for about 30 seconds, when I realized my back tire was also blown. Now when all the books, all the pros, all your triathlon buddies, and your father tell you to carry more than one tube with you, you should probably carry more than one tube. Not me, because I have always been one to learn the hard way. So it was off with the shoes and helmet, and just as I started to shuffle along the long, desolate road like a dog with my tail between my legs, a truck pulled up along side me and a very friendly looking young guy offered me a ride. I don’t think I even hesitated in my response. That would have been one long, dark, lonely walk. It was my first flat tire, but it certainly won’t be my last, and I am just glad to say there were two lessons learned: charge your cell phone and pack extra tubes. My nerves are sending jittery pulses from my racing heart down through my fingertips, and I can barely stand still. I have spent months preparing for this moment, and I am overwhelmed with a plethora of emotions. I look up at the glaring crowd in the bleachers and I feel engulfed by their presence. Their cheers are piercing through my reverberating ear drums in muffled tones. This is the Olympic Games and I am about to grace the world stage in the finals of the 100m freestyle. As we line up along the deck and prepare for the start, I feel focused and ready to compete. In my mind, I am baffled as to how I got here. How is it that I am at the finals of the Olympic Games, competing with the best in the world? I suddenly feel a rush of pride and confidence. This is my moment. This is my time to shine. As I take my mark, I crouch down into position, and then with the blast of the horn, launch myself forward into the calm, clear water below. But instead of a clean dive through the water my body is abruptly stopped and I barely break the surface as I bob forward. In this moment I realize that I am sporting a wet suit and life jacket, making it exceedingly difficult to swim. My arms flail in a frantic form of splashing and turmoil, and I can already hear the disapproving words from my coach. Why is this so difficult? Out of the corner of my eye, I see my competition gracefully, and powerfully charging through the race. I begin to panic, and my legs thrash through the pool. If I don’t get going soon, I won’t even finish the race. It’s like trying to outrun a monster in a nightmare, but my body won’t move. As I look back again at my competition I realize that I have barely managed to flail through one lap of the pool before the race is over and the winner has been declared. The cheers from the crowd intensify as I quickly slip under the rope to the edge of the pool and shamefully try to get out of the water as quick as possible. I can feel my cheeks burning with embarrassment, and I shut my eyes tight hoping that I will either disappear into thin air, or this nightmare will end. Why did I wear a life jacket and wet suit to the finals? As I look back at the deck, I see them raise our country’s flags in order of the final results to realize I did not come in last, but eighth out of nine. I wasn’t a complete disaster, eighth in the world isn’t all that bad. 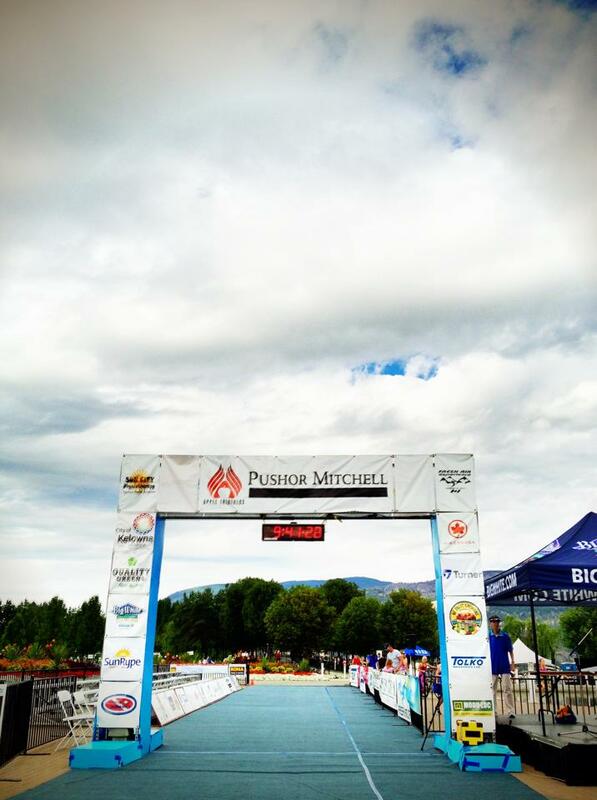 I dream of triathlons or at least one of the three sports almost every night. It has become a passion that I obsess over in my waking life, just as much as in my dreams. Sometimes in these dreams I am fulfilling greatness or failing miserably. As the author of The Triathlete’s Training Bible, Joe Friel said, “achieving the pinnacle of excellence requires living, breathing, eating, and sleeping triathlon every day. Literally.” So I guess I am following his advice pretty well. I just hope that tonight’s dream is back to me achieving greatness, and not flailing through a pool like a drowning giraffe.